It is best to start small if you have never been into the adopables "scene". First and foremost, you should always develop a set of rules for your current or future adoptables. List out what the adopter is and isn't allowed to do in terms of the character they've purchased or adopted from you. Secondly, you will need to work out how you are going to set your prices, or starting price, in the case auctioning off your adoptables. Look around at other key members of the adoptable community and see what and how they set their prices for different varieties of adoptables. If you want your adoptables to sell, ensure they aren't something that has been seen before. If adopters aren't finding your character designs interesting, chances are you're going to have a hard time selling them. There are so many adoptables and characters in general out in the world - it will be hard to make something that will stand out above the rest, so don't expect to instantly come up with a top-selling idea or design without experiencing artist's block. Don't be afraid to branch off from what you usually do. It does not look good to potential buyers if you just use one base on your designs and make multiple characters with different colours or patterns. A great way to market your adoptables is to gain an audience. If your adoptables are catching people's eyes, you will start to gain a small following. This will most likely be in the form of watches. If you feel like you aren't gaining an audience, put yourself out there. deviantART's forum is a great place to start. The ThumbShare or Premium ThumbShare forums can be used to show off your adoptables and interact with other adoptable creators and buyers. Just be sure to read the forum rules before you start delving into the forums. FAQ #801: Are there any rules for the Forums? Commenting, favouriting and critiqueing other adoptables will help you garner friends and have your presence noticed in the adoptables community. Just like any job that involves customers, the way you treat your customers will influence whether or not they will come back to you. Reply to comments left by your potential buyers if they ask any questions. Unlike face-to-face communication, where intent is more clear, any wrong wording in a comment and they may think you are being rude or blunt with them when you're actually not - so keep that in mind. I have a question tho: How do I set up a way of payment if I were to make adoptables? Like, do i set up a donation pool where ppl can submit their adoptable payments? TY but I have a question: do you have to have points to sell adoptables? the ones i make that are like that NEVER, EVER, SELL. make it something they HAVE seen before. make a weird eyeball creature that looks like nothing they have literally seen before? nope, won't sell. they haven't seen something like it before, so they aren't happy with drawing it, thus, no one buys it. don't do something weird or creative in every way. do something they have seen, they'll be happier with drawing it, they'll be fine with buying it. I think that point still stands, seeming as you can get creative with more mainstream things that people like to draw. I have adoptables open, and I know this post is old, but I donno how to get people to buy them. I offer them a non watermarked version, and I've even put some of them on sale. But no one seems to want to buy them. Wait, how do you actually SELL them? So once someone has claimed an adoptable, if they want it sent to them send them a refrence sheet with the base colours? But i have a question! How do i earn points from adoptables? When someone has claimed an adoptable and they want a refrence sheet sent to them would i do it through email? People will send the points through either gifting or donations, it's your choice, really! What I do is I put up a donation pool for 100,000 points or more. Whoever gets the highest bid (or if you're just selling them, no auction, whoever claims it first) puts their points in the donation pool. Since they donated the points to you, they will be put into your points balance. what do we do after selling it? like giving how do i give it to them? Ok but what do I click to do it? When somebody pays you for an adoptable, do you have to do anything after that..? Like make a personal image file for them or something? tysm!!!! I am starting to sell adopts and this helped me!!!! How do you put a price on adoptables?! How do you do that little point thing in the description?! To do the thing simply type : points : with no spaces! Points ( ) are Deviantarts digital currency. You can receive them through buying them directly from Deviantart (go here to purchase points www.deviantart.com/account/poi… ) or you can receive them from other people on Deviantart. Generally, 100 = 1 USD, however generally people prefer USD over points. I really want to make and sell some adoptables, but if someone buys them, do I send it to them? if so, how do I send it to them? So.. you had to send them the psd file? or just a png without watermark kind of thing with the colors, etc..? Something like this. Have either just the base colours for the actual picture, or have it shaded with the base colours on the side. After someone purchase an adoptable, how do you give it to them? Having the same issue here..
"It does not look good to potential buyers if you just use one base on your designs and make multiple characters with different colours or patterns." It looks fine to me when someone uses the same base over and over again and just changes colors and patterns. :/ I like seeing how many different designs they can come up with. Lolisoup does some great variations, just off the top of my head, from the same bases. I might add, most people I see making adoptables using the same base and just changing colors/patterns don't seem to be having any trouble selling them, they've obviously got demand for their work. It can be a bit of a put off and does tend to lower the price of those particular characters because it's more like selling a skin of that character instead of the character. Then again this appears to be more short term when the artist still hasn't got much following. One thing I have noticed, those that have 9+ characters on one deviation get small amounts for those compared to the deviations on their own or only about 3 on the deviation even when the artist becomes popular regardless of whether they're individually made or just bases. Very true, I've noticed the same things you say there. "Unlike face-to-face communication, where intent is more clear, any wrong wording in a comment and they may think you are being rude or blunt with them when you're actually not - so keep that in mind." Yeah don't even get me started on that one. I just have new "Little Ladies" adoptables, and I based one on a deviants OC and sent her a link to the adoptables, saying #15 was for her. Suddenly she starts sending me messages saying thing like "Um, did you just copy my OC and sell her as an adopt? Cause it really looks like it. Um, you aren't really allowed to do that. She's my OC and you really can't sell her like that." and I'm like "I'm not selling her, I created her for you in case you want her. If you read the description it says she belongs to you. I made her as a gift but if you don't want her I can just delete her." Right now I feel both confused and sad. I've seen people give out adoptables trough contests, raffles and giveaways so I thought that gifting free of charge adoptables to random deviants would be a nice gesture, because it would have the surprise factor that contests/raffles/giveaways don't. But there has a been a clear failure of communication on this one and it makes me sad that it happened, offended that she would even consider I would steal her OC and confused that she would think I'd send her a direct link to it after doing so. It really hurt my feelings. I just want this all miscommunication/language barier thing to go away. I just don't really know what to do from now on. I'm a nice person. I like to surprise people with free customized stuff for them. But on the other hand I don't want something like this to ever happen again. Were they all on the same sheet because if that was the case, she probably just saw the thumb & panicked. Please don't let one deviant's misunderstanding and negative reaction blunten your enthusiasm or creativity. That was a very baffling mistake they made, since you sent them the character... It'd be kinda funny if feelings weren't hurt. Super helpful for someone interesting in making Adoptables! Step 1. Go to a journal skin found in the Installable Journal Skins gallery. Step 2. On the sidebar of the deviation page, you will find an "Install" button. Click it. Step 3. You will be taken to the "Write a Journal" page, where you can start writing a journal with the skin. Please note that journal skins can only be used by Premium Members. Welcome to the deviantART Related Dictionary! This is a journal entry that will define galleries and other terms specific to the deviantART Related gallery. For a more in-depth dictionary with general deviantART terms, check out Fella's Dictionary. Terms in green were defined and sourced from fella's dictionary. A character design that can be adopted or purchased by other deviants, at either a set price or auction-style bidding. dA Related CR Update - August 2013Hello! Welcome to the August edition of deviantART Related's communityrelations update. To celebrate deviantART's 13th Birthday, I held a contest for the gallery! The contest closed last week and in a few days time the winners will be announced. Did you know there are games on dAmn? Yes! Popular card games and board games are being brought onto dAmn by some very awesome deviants. In this article I'll be looking at some games that have been brought to dAmn over the past couple of years. There's also an interview with negroceries, who has recently brought Taboo to dAmn. dAmnGames is a group that was created to be a hub for games played on dAmn. Watch this group for the latest news on your favourite dAmn games. The game of unspeakable fun! dAmnIt! was a database of funny quotes submitted by deviants like you. As of November 30, dAmnIt has been removed from the site. Feel free to note TheLOLCorner with a quote from the chat or forum. More details about this can be found here. PE: Devious FunWhat is Devious Fun? The Devious Fun category is for deviations that were created for fun and light-hearted purposes. This category has sub-categories, here are brief explanations for each of them. dA Related CR Update: November 2012Welcome to this month's Community Relations Update for the deviantART Related gallery! So how does one go about hosting a successful contest? There's no fool-proof, super secret formula, of course, but there are some general tips and guidelines for what you can keep in mind when planning a new contest. This content has been relocated offsite. Sorry for the inconvenience. Many deviants offer commissions, but how do you effectively advertise them? This article will go over some methods for maximizing the exposure on your commissions so that they can be as successful as possible. This is the one method I cannot stress enough. Commission Widgets are one of the most effective ways to advertise your commissions because they not only feature your commissions on your profile page, but also add them to the searchable database of dA's Commission Page. Numerous deviants use the Commission Page to find artists to hire, so it is a smart idea to add yourself to the database. Be An Active Watchee We all want active watchers; people that comment on our deviations and add them to their favorites. That get involved in whatever projects we have going on, polls we post or anything else. Active watchers are awesome and we're lucky to have them. But are you an active watchee? Some people return watches, some people don't. However you do it, a big key to have active watchers for most of us is to be active in return! But what is an active watchee? Avatars, whether for a Personal Site or a Group, can say a lot about the Deviant or Group by how the Avatar appears on the profile page. All Deviants and Groups can have an Avatar, as long as the Avatars are within certain parameters. Many Deviants keep the same avatar for years, often becoming known by their Avatar. Others will change their Avatars as the seasons change, or to match an upcoming holiday. Some Deviants have their names on their Avatars, some have flashy Animated Avatars and some have classic, simple Avatars. Since Avatars can be easily changed, there are Deviants who change their's as their mood, likes or dislikes alter. Hello. This is iDJPanda on the topic of shading! When I usually start into the shading process of something, I always struggle to see which kind of technique I can use to give the piece of art the type of wow that I want. But just like anything, there are MANY ways to do it! This can help you use different shading techniques for different textures. I'm gonna give you a few different ways you can shade (Try to shake it up! ). If you have any other ways you shade, please feel free to tell me! One of my favorite, in this technique of shading, you go against what all elementary teachers told you. You scribble! When you shade like this, you'll come out with something that looks like this. Using circular motions, you generate different shades. Spending more time, swirling makes the certain areas you want darker, and the less you swirl makes the other areas lighter. This is not necessary, per se, but if you have in mind to do more than just one or two sheets of adoptables, it might be a good idea to start a new account. This way you won't spam your watchers' inbox, if they're not interested in adoptables, and you can organize your gallery in a better way. dA is a big community and the sheer amount of new deviations every day makes it hard for your art to be seen. Considering that you just made a new account for your adoptables, you have basically no watchers whatsoever so how can you get the exposure you need to sell your characters? The answer is join Adoptables Groups. By doing this you can do two things, the first is submit your adoptables to their gallery and advertise them, the second is observing the trends, what people like to draw and buy more. 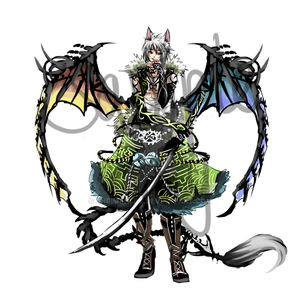 Adoptables are Original Characters, short OC, created by one deviant to be obtained by others. There are different ways of how to get hold of them, that will be explained in detail further below of this article. While the copyright and the idea remains to be property of the adoptable creator, the new owner usually has the right to do "whatever they want" with the OC. That means, they can change certain characteristics of the overall look, can give them names, can create background stories and everything else that makes them a complex character. Additionally to that they can use that adopt to be used as avatars, in new artworks, as page dolls, as characters in stories or RPG and much more. Of course there are still rules by the original creator that should be followed. 10 Tips On How to Get Your Adoptables SoldIt's Intelius here, The Pound's Co-Founder. I just wanted to let everyone know that I have completely rehauled the folders. I've touched the names up, cleaned them up entirely, and basically just spent a lot of time on it. Now I'd like to share with you a few tips on how to get your adoptables sold faster and just general things you should know. Labelling your adoptables 1-whatever makes it a lot more easier for viewers to buy. It's not fun having to say, 'oh i'd like that one with the green and the blue and the heart and yeah'. With numbers you can quickly just say, 'I want to buy 4!' and be done with it. 2. When an adoptable is bought cross it out or put sold in the description. Don't keep your buyers in the dark on whether or not an adoptable is taken. Make it easier on them and they'll be more prone to buy. Keeping your description neat and short is also a big plus. PE: Kalamkari - An Indian Art StyleHi! I'm Bansini, and I'm going to be introducing you to the Indian art style : Kalamkari. Not many people know about this style of art, and this includes Indians. Kalamkari, which literally means 'pen work', are paintings done on cotton textile with vegetable or natural dyes. For information on the history of Kalamkari, click here. For it's technical aspects, click here. Okay! So before I jump in into how Kalamkari is done here, I'll gloss over why you should try it out atleast once in your life. Hello, everyone! Ross here, for the Writing Basics week hosted by CRLiterature at projecteducate, and I'm talking about writing less. If you write from time to time in your life, it's certain that you either 1) are about to write too much, 2) are currently writing too much, or 3) have just recently written too much. We're going to help fix that. Our world is so full of noise and distraction. It’s no wonder “Walden” is a classic—Thoreau had time and quiet in which to write it! And plenty of inspiration from nature. So how do we focus, as writers, on our craft? Even if it’s our passion, sometimes it takes a lot of effort to sit down and just write—especially if we struggle with attention or hyperactivity, whether diagnosed or not. As someone who has studied both academic writing and reading in college and graduate school, and a veteran of National Poetry Writing Month for 7 years and National Novel Writing Month for one, I can attest that intentional writing, for fun or for a grade, is not easy to focus on, especially without a good writing environment. So what to do? Many professional writers will tell you just one simple thing: write. James Patterson said, “The trick is making writing into a daily habit. Same time. Same place. Same hot beverage of choice. Hello guys! This is iDJPanda on the topic of "Commissions"! Bear with me though. I've never given a commission in my life but I know how people portray their commissions to get them! I hope this article may be of some help to you guys. If you're like me, you LOVE examples. And you ask, "Why are examples so important?" Want to learn how to make your page not just nice or pretty, but spectacular, unique, and all-around awesome? This article covers the newest stage in the evolution of profile design: Profile CSS. Please keep in mind that this article is only for Premium Members who are not beginners to profile design. If this is your first time trying your hand at customizing your profile page, you'll probably find the following articles more helpful than this one. Casting is a process in where a solution(usually mixed with a curing agent, or hardener) is poured into a desired mold and then left to set and become a solid, which gives you the desired structure. This process is thousands of years old, and comes in many different forms. Examples of casting are metal casting (or metalwork), glass casting, resin casting and many others. Literally anything you can pour into a mold which becomes solid is considered to be in the art form of 'Casting'. It's regarded as a diverse practice, so no one can really define a specific cast, it's usually up to the artist to use a preferred or specific cast to get the most desirable results.